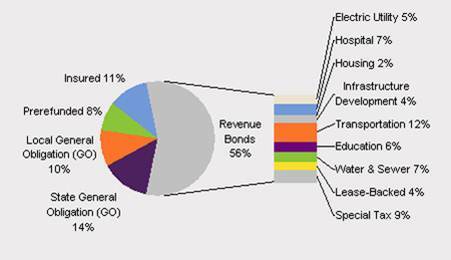 Revenue Bonds pay interest and principal only from a dedicated revenue stream generated from a project or a facility such as a toll road or a water and power system. When the revenue stream generated from these projects is not sufficient to maintain debt-service coverage the issuer of the bonds will default on payment. There are no other sources of income to cover this shortfall. [Source: Barclays Capital Municipal Bond Index components as proxy for the mix of the investment-grade muni market, as of April 26, 2011.] This presentation contains CONFIDENTIAL INFORMATION which may also be LEGALLY PRIVILEGED and which is intended only for the use of the individual or entity named above. If the reader of this presentation is not the intended recipient or the employee or agent responsible for delivering it to the intended recipient, you are hereby on notice that you are in possession of confidential and privileged information. Any dissemination, distribution, disclosure or duplication of this presentation is strictly prohibited. The information contained herein has been obtained from sources believed to be reliable but we do not guarantee accuracy or completeness.